Snakes run the gamut in natural habitats. While many of these reptiles reside in the water, the bulk of them live on terra firma. Copperhead snakes (Agkistrodon contortrix) are willing to go into the water, but they're usually seen elsewhere. These snakes are toxic, so it's wise to stay away from them. Copperhead snakes abound throughout their geographic scope, which is made up of the United States and Mexico. Mature specimens are usually around 30 inches long, with physiques that are chestnut in color. They are sturdy and robust in build. Copperhead snakes dine on mostly meat. They release their venom via their fangs. Venom assists them in feeding, as it controls their prey when they attempt to eat it. Although mice are the biggest staples in their diets, they also consume lizards, insects, tiny birds, amphibians and even fellow snakes. As far as bugs go, cicadas are particularly common meals for them. 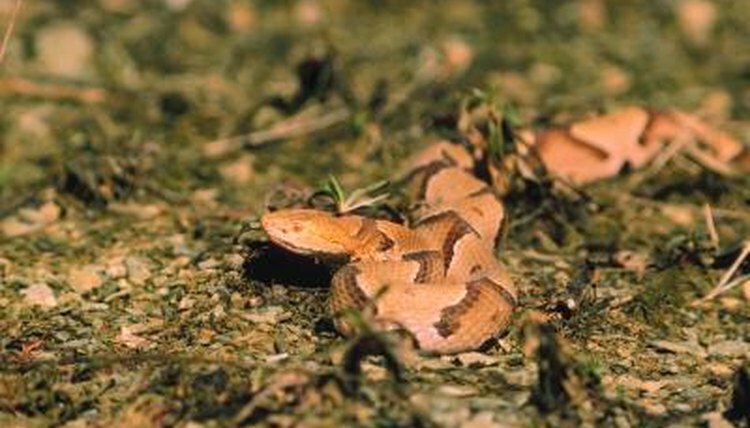 In terms of habitat selection, copperhead snakes are prevalent in a combination of semiaquatic and dry settings. Not only do they frequently inhabit marshy locales, but also rugged woodlands with lots of hills. Copperhead snakes tend to stay on the ground, but they occasionally ascend tall plants in their surroundings. When they hibernate, they typically do so in holes dug out by other animals, in caverns, amidst stones or in logs. It isn't unheard of for copperhead snakes to live near human establishments. Copperheads frequently live close to the water, and as a result are sometimes spotted going into it -- of their own volition. When they go into the water, they swim. Although they're usually on dry land, their swimming skills are proficient. Snakes, across the board, are generally capable of swimming, even if they don't do it too often. Copperhead snakes are near kin to water moccasins (Agkistrodon piscivorus). As their names communicate, they spend a lot of time in the water, sometimes on the floors of streams and rivers. Water moccasins favor wet environments, although they sometimes venture onto land to spend time amidst plants. Water moccasins occasionally hide out below tree limbs and logs on land. They are also called cottonmouths because the lining of their mouths is white. Like copperhead snakes, they are also venomous. NC State University Cooperative Extension: How Dangerous Are Copperhead Snakes?